Before too many days and blooming Daffodils slip away in this wonderful month of May, a little Friday tidbit to share - May is ‘Gardening for Wildlife’ Month. David Mizejewski, Naturalist and Personality for the National Wildlife Federation said, "May is a wonderful time to get gardening and a great time to attract some of nature's most beautiful creatures to your yard. Taking simple steps in your garden to encourage wildlife is not only personally rewarding it also provides myriad benefits to animals and ecosystems." The hummingbird is the National Wildlife Federation’s feature species for the month and one of my favorites I love to spot in the garden. So let’s talk plants that can attract Hummingbirds. There is one in particular (and from personal experience) that works for us every summer. Around this purple mass, we always see Ruby-throated Hummingbirds flitting about in our gardens. One note to make - I typically don't entice our birds with feeders, just plants. Having a perfect habitat (meadow and woodland edge is helpful) but it's the flowers and the small habitats you can create very easily that naturally bring these creatures up close and personal. So what is this wonderful perennial? It’s definitely a favorite–commonly known as Catmint (Genus is Nepeta). There are several varieties but this is our prize - Nepeta sibirica 'Souvenir 'd Andre Chaudron'. For our habitat garden, it’s one of the ‘Hall of Famers’. 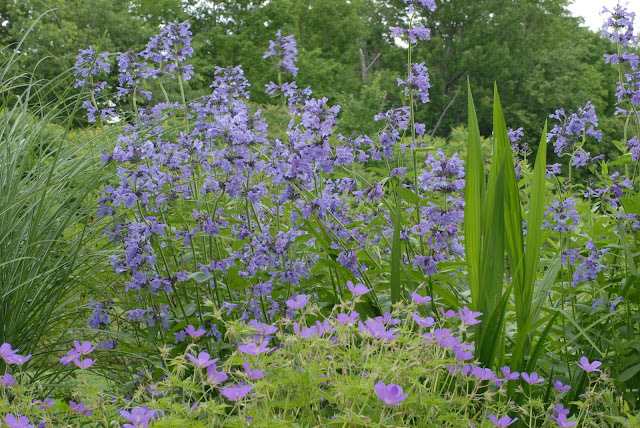 Hardy to zone 3-8, which means it can handle some pretty cold temps, this versatile plant is also drought tolerant, something to look for especially in habitat plantings. Want more great characteristics? It has a long bloom plus long-lasting, which means it can take a stand in your perennial borders for years to come. Our plants have grown five feet although the catalogs may say 2-3'. It depends on your site conditions but give it plenty of room to grow and spread. It is robust enough to smother out even the toughest of weeds. Keep transplanting it in different areas to create your own purple wave effect.